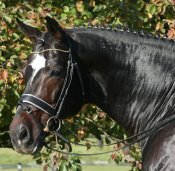 Davignon II a modern stallion with a dark jacket and a glamarous face. 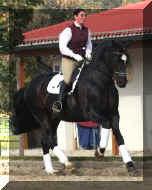 His figure, rideability, basic gaits , temper and character are the most spectacular attributes of Davignon II. 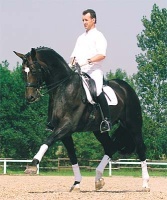 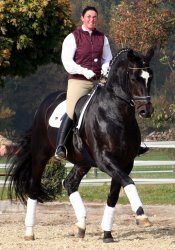 His father Donnerhall - he is well known for his high sport level and his excellent descendants - is surely the most important dressage stallion in the last years The combination of Donnerhall with mares of Pik Bube - is a great guarantee for horses with extraclass and high talent. A full brother of Davignon II mother Piroschka - Pik Royal - was very successful in dressage spoer , till he was sold to america. 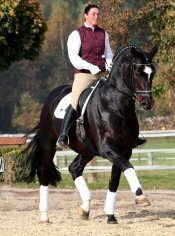 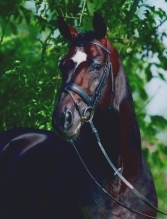 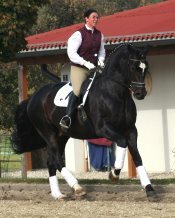 Davignon II a very special stallion for breeders and a high talented sport horse.